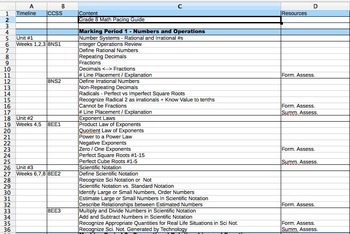 This is a fully common core aligned math pacing guide for 8th grade. It breaks down units into unwrapped standards and topics to be covered within each standard. Suggestions are made for when formative and summative assessments should be administered and there is space to input whatever resources your individual school/district uses. This is a great tool for anyone who is unsure of the Common Core expectations for 8th grade math.